A speech in Detroit, Mich.
Gary Cohn said the White House tried to repeal the carried interest tax break for hedge funds, but it failed because lawmakers were too solicitous to Wall Street lobbyists. By Louis Jacobson on Wednesday, December 20th, 2017 at 5:55 p.m.
As a presidential candidate, Donald Trump pledged to eliminate a tax provision of special interest to hedge fund managers. Trump said that under his tax plan, "we will eliminate the carried interest deduction and other special interest loopholes that have been so good for Wall Street investors, and for people like me, but unfair to American workers." Carried interest refers to the profit earned by the general partner of a private investment fund. That income is treated as a long-term capital gain, which is taxed at a lower rate than ordinary income. On a number of occasions, Trump has argued that the provision is unfair to American workers. At one point, he said that fund managers were "getting away with murder." On Dec. 19 and 20, the Senate and the House passed the final version of the tax bill, which will go to the president for his signature. But an elimination of the carried interest provision was not included in the bill. On the eve of passage, White House chief economic adviser Gary Cohn -- a former senior executive with the Wall Street firm Goldman Sachs -- blamed lawmakers for their willingness to appease lobbyists. 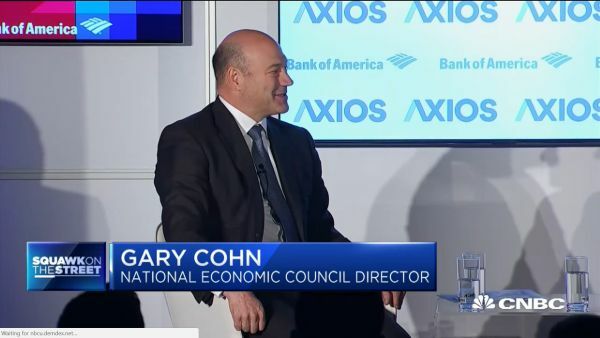 "We would have cut carried interest," Cohn told Axios co-founder Mike Allen. "We probably tried 25 times." But he said the administration "hit opposition in that big white building with the dome at the other end of Pennsylvania Avenue every time we tried. It is just the reality of the political system." By Allison Colburn on Thursday, October 5th, 2017 at 3:05 p.m. While running for office, President Donald Trump promised to get rid of a tax provision that he said he himself had taken advantage of — the carried interest "loophole." "One thing I'd do is get rid of carried interest, one of the greatest provisions for people like me," Trump said at the second 2016 presidential debate. "To be honest with you, I give up a lot when I run because I knock out the tax code." Carried interest refers to the profit earned by the general partner of a private investment fund. That income is currently treated as a long-term capital gain, which is taxed at a lower rate than ordinary income. Trump, in the past, has argued that the provision is unfair to American workers. But so far the White House hasn't taken initiative to get rid of the provision. The Trump administration's 2017 tax legislation framework made no mention of doing away with the carried interest tax break. When Face the Nation host John Dickerson asked House Speaker Paul Ryan about this Oct. 1, Ryan responded: "That's something that the committee's going to make a decision on." White House officials have sent mixed signals about plans to end the provision. In August, U.S. Treasury Department Secretary Steven Mnuchin told reporters that Trump planned to keep the tax break for job-creating firms and end it for hedge fund managers. The day after the tax framework was released on Sept. 27, White House Economic Adviser Gary Cohn said Trump was still committed to completely ending the deduction. Since the current tax plan doesn't include eliminating the loophole and Republican leaders are sending mixed messages, we'll rate this one Stalled.